Also known as: Aborigine’s Comb, Chik, Etcho, Hairbrush Cactus and Hecho. With limited space in Ola Brisa Gardens, we’ve made difficult decisions about what plants to showcase. Early on we decided to have only a few (and those for accent) cacti. Hence, this huge beauty – the Indian Comb – does not presently grow here. But who knows, one might ultimately find a home in the expansion area across the street! However, several presently grow about 100 meters from us, on our ridge overlooking the Santiago Bay. Beyond those, in a landscaping project I have undertaken for a friend, I enjoy several older beauties on the steep slope below his home. It is from these two locations that the pictures of these more mature specimens come …though many nurseries sell small ones. How else might this cactus be identified? The red fruit are slightly less than three inches (76 mm) in diameter split apart at maturity. (Photo by Nathan Peach). Its five to ten centimeters long flowers are white with a reddish brown exterior and showy with purplish outer petals, white tepals and one-half to four fifths of an inch (13 -20 millimeters) long floral bracts. Each has a floral tube that is covered with dense brown velvety wool. Its blooming season is different from all other columnar cacti in that it can flower at any time. Its slightly less than three inches (76 mm) in diameter fruit are red and split apart at maturity. Each of them is densely covered with about two-inch (5 cm) long, golden yellow spines that are, for all intents and purposes, harmless with pulp which is firm and, just barely, juicy. As these fruits develop they seem to appear in large golden clusters on the plant’s arms providing that attractive look admired by many. 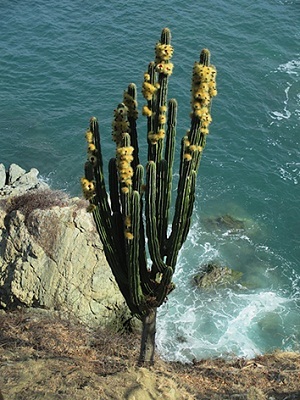 According to the International Union for Conservation of Nature and Natural Resources, the Indian Comb grows in Mexico in Baja California Sur, Chiapas, Chihuahua, Colima, Guerrero, Jalisco, Michoacán, Nayarit, Oaxaca, Sinaloa, Sonora, and Zacatecas. Yep, here on the coast in the State of Colima – lo and behold – we find them majestically proliferating! 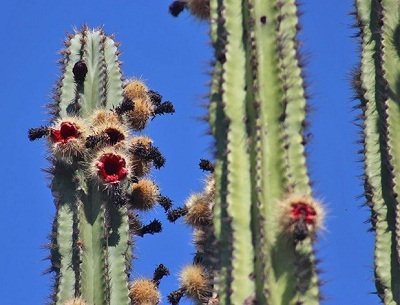 Should your zeal to know more drive you to it, there is a somewhat scholarly abstract on the “Geographic differentiation in the pollination system of the columnar cactus Pachycereus pecten –aboriginum1” which may be found on the American Journal of Botany site. But, I gotta’ admit , my eyes glazed over a bit perusing it as I’m just an old ”root around in the dirt” sort of plant guy! Now for the “grocery store, check-out lane” Expose’ type info! 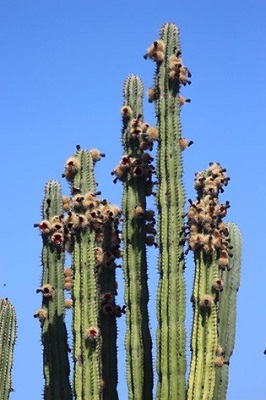 The book Plants of the Gods purports that the juice of the young branches of the Pachycereus pecten-aboriginum are used by the northern MexicoTarahumara Indians who live in the canyons of the Sierra Madre Occidental to make the peyote substitute, narcotic hallucinogenic beverage “cawe” or “Wichowaka”. This, rather appropriately, means insanity. Rather drought-tolerant, the Indian Comb is obviously suitable for xeriscaping. If you’ve got space and enjoy cacti, this would be a great one to have!